NOTE – Kendoon YH has now closed. 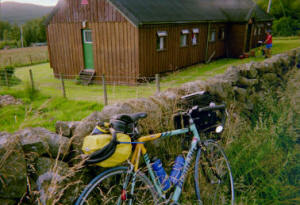 However thanks to Dave Barker, who has found bunkhouse accommodation here. Also note that Carlisle YH during University term time is student accommodation so check for availability in advance. 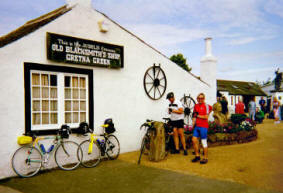 Over the border and a brief visit to Gretna at the famous Blacksmith’s Shop. Mark proposed to Keith but he resisted the temptation as he said that he’d continue sleeping with me! Posing for some wedding photos of our official carrot dressed in a tissue paper wedding dress and bouquet with the official piper – (who seems to be looking very jealous of the happy couple in the photo below! ), before heading on towards Dumfries. 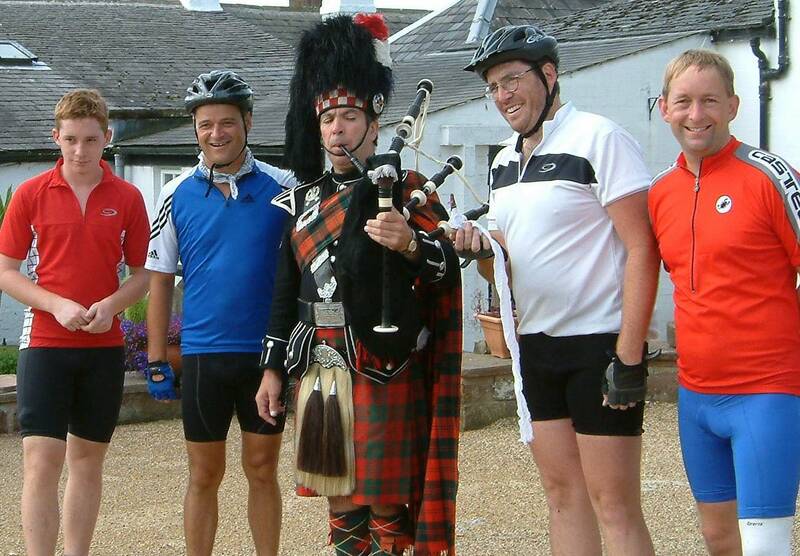 We stopped for a brunch at Annan before cycling on to Dumfries in to a very strong headwind. Although we found a Halfords open on the Sunday afternoon, they didn’t really have a suitable wheel or tyre for our repairs so we continued with crossed fingers. Food – We had a problem with sending our food parcel to Kendoon YHA. The YHA warden seemed to be particularly unhelpful and inflexible as he never appeared to be in when the postman arrived with our box of goodies. Despite phonecalls to him, our food parcel remained in the post office at St Johns Town of Dalry. This meant that we ended up changing our route so we could pick up the parcel, a route that took us along 9 miles of the busy A75. There was a silver lining to our cloud however as the excellent pub in St John very helpfully looked after our parcel so that we could collect it when we came through on a Sunday afternoon. The pub does very good bar food and the beer isn’t bad either! There is also very little in the way of food at the hostel – even down to essentials like milk for a cup of tea etc. Fortunately somebody who had left that morning left 4 pints of milk which the warden very generously said we could use! There was also another silver lining as we found a superb combined tea and antiques shop with excellent friendly hosts just off the A75 near Lochfoot. The OS 1:50 000 map on Streetmap is out of date as The A75 is a dual carriageway at that point and marked on the 2004 1:50 000 OS map as a Green Trunk road. To find the tea shop (well worth the effort!) Coming from Dumfries on the A75 you come to a new roundabout at the end of the 1.4 Mile stretch of dual carriageway at Cargenbank. At the roundabout take the first exit (Left) on to a minor road (signposted to Lochfoot) and then almost immediately left again so that you are cycling alongside the A75 in the Dumfries direction. You should be able to see the tea shop about 200Metres away on the right of the road. For our mid morning stop we found a café in Annan with a small patio area out the back, that served baked potatoes that was OK and open on a Sunday morning. The Route – The A75 is very busy with lots of heavy commercial traffic and I would certainly not use it again. 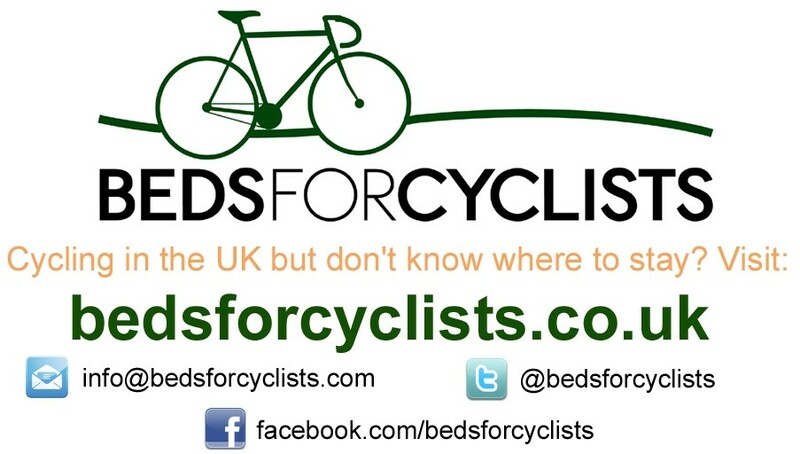 I think it would be worth the 9 mile round trip from the YHA to St John to follow our original plan from Dumfries to follow the B729, or take the hillier lane that shadows the A75 from Dumfries to Milton and then right to pick up the A712 at Crocketford. The A712 off the A75 towards St Johns was very pleasant though. Gentle incline and some nice downhill sections along reasonably traffic free good quality surfaced road. The approximate route we followed for Day 9 is listed below (1:50 000). From the YHA we followed the dual carriageway East back over the river and turned L (A7) on the big roundabout where the A7, A69 and A595 meet, crossed river and followed the A7 to Longtown where over the river and L on to A6071 towards Gretna. We turned off the A6071 on the lane past Springfields and Gretna Green to pay homage to the Old Smithy, we then picked up the NCR7 / B724 just West of Gretna and followed it towards Eastriggs and on to Annan. Carry on the B724 until the junction with the B725 that you follow all the way to Dumfries. Our initial plan was to follow the B729 from Dumfries to Glenhoul, but thanks to the unhelpful SYHA warden we changed and followed the A75 to Crocketford before turning R and following the very pleasant A712 to St John’s Town of Dalry via the B7075 and A702, and the B7000 onwards to Glenhoul and Kendoon SYHA.